Systems with redundant cabling can be implemented easily using POWERLINK. Unlike ring redundancy, cable redundancy does not require cable looping, which can sometimes be problematic. This allows the creation of all types of tree structures. When using a device with the link selector function, data is always transferred via the highest quality network lines. The link selector function is integrated in the X20HB8884 compact link selector. This makes it easy to connect any POWERLINK device to a redundant POWERLINK network. The AC808 Ethernet hub is a standalone device that can be used universally as a Level 2 hub in standard Ethernet or POWERLINK networks. It is suitable for both 100 Mbit/s (Fast Ethernet) and 10 Mbit/s networks. The hub automatically recognizes the transfer speed for the channels. The X20HB8880 hub is a device that can be used universally in standard Ethernet networks or POWERLINK networks. It is suitable for 100 Mbit/s (Fast Ethernet) networks. Recording and analysis of CRC and frame errors. Triggers can also be activated using external digital signals. Analysis of both half-duplex and full-duplex networks. Able to record two networks simultaneously. SmartWire-DT Gateway EU5C-SWD-POWERLINK to communicate with POWERLINK. Whether a Master or Slave conversion to PROFIBUS, CANopen, DeviceNet, Modbus RTU, ASCII, 3964R or netSCRIPT is needed in your POWERLINK application the industrial gateway series netTAP 100 will provide you a suitable conversion solution for your needs. It features transparent data transfer between the two protocols, is compatible with all major PLCs and is easy to commission with a common configuration tool. netTAP 100 is the protocol converter for sophisticated conversions and supports 2-port Real-Time Ethernet to serial, Fieldbus to Fieldbus, Real-Time Ethernet to Fieldbus and Real-Time Ethernet to Ethernet conversions. It supports slave and master functionality in any combination. Master functionality is unrestricted when licensed. A memory card slot allows the user to save firmware and configuration data on a removable card. In case of failure all that is necessary to bring the plant back on line within seconds is to move the memory card from the old netTAP 100 onto a spare unit. Apart from standard protocols, netTAP 100 supports the creation of serial protocols with the Lua-based scripting language netSCRIPT. A full featured development environment is included within the delivery. It allows the comfortable and rapid programming of any proprietary serial protocol as well as the I/O data pre-processing during the conversion into the other field protocol. 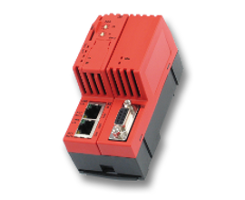 The POWERLINK communication module (MXI) allows you to expand your 9400 Servo Drive into an ETHERNET POWERLINK node. The drive can be used as a Controlled Node (CN) or a Managing Node (MN), meaning it can perform motion control tasks without the need for an external control. The integrated 2-way hub enables linear wiring to be implemented without external components. Five LEDs make it easy to diagnose the device and bus states. You set the device address via a DIP switch. 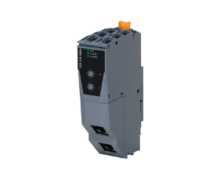 Lenze offers an external 8-way hub to complement the 2-way hub integrated in the ETHERNET POWERLINK interface modules. This infrastructure component corresponds to a class II repeater in accordance with IEEE802.3/u. It automatically detects whether it is being operated in a 10 Mbps or a 100 Mbps network. Hubs can be cascaded via a special uplink port. With an online product Configurator and very short delivery times. The innovate modular slipring system MIA achieves the transmission of POWERLINK, further common databusses, electrical Power and Signals. You can choose between two basic unit options (MIA1 and MIA2 - each of them are available in different lengths). The slipring system can be extended with a media rotary joint, Power Adapter and Gigabit-Ethernet Adapter. GigaPLUG is a contactless plug which supports the transmission of POWERLINK and other common Ethernet based protocols. The technology is based on a capacitive contactless transmission, which is used for many years in a lot of rotating systems of Schleifring. The GigaPLUG instead transmit the data in a stationary system. Due to the shock- and vibration resistance a reliable full-duplex transmission can be make sure even in environmentally unfriendly conditions (IP66). The contactless transmission generates a mechanical wear-free system, in which you can achieve unlimited plug-in cycles of connector operations. In addition to wired communications interfaces such as a digital input and a digital output, 2 x CAN, Ethernet und RS232, the ESX-TC3G also provides a USB interface for service purposes. For data exchange via radio, an optional 2G/3G mobile radio connection, WLAN and Bluetooth are available. The ESX-TC3G is equipped with a GPS/GLONASS receiver for position determination. The ESX-TC3G is available in two different antenna versions, with integrated antennae or connections for external antennae. The Wireless Ethernet System of Schildknecht AG is the solution to build industrial networks in a robust, flexible and powerful way using data radio transmission systems. The DATAEAGLE 4000 series was especially designed for a transparent data transmission of Ethernet and Modbus TCP using various radio technologies. All devices featuring an Ethernet interface may be connected via radio. Using IoT Edge Gateway of Schildknecht AG enables transmitting data from the control unit into the cloud. Thanks to the eSIM card which is operable worldwide systems can be networked in all over the world. So IoT Edge Gateway DATAEAGLE 7050 is the optimal solution for analyzing data of machines in real-time, for remote maintenance, as well as for remote monitoring of systems for predicting component fatigue. This involves new business models for our customers in the form of services for their customers. Data analysis enables an increase in operating costs or improvement of products and services. Data preprocessing in the IoT Edge Gateway allows for data compression, providing for lower mobile radio costs at a standard rate independently of the respective place of installation. Mobile radio features the highest network coverage in the world and thanks to the role-based billing via the portal billing provides for an easy cost assignment according to accurate measuring points as well as accounting. The eSIM card automatically selects the best network among 400 providers (Unsteered Roaming). Devices and data are managed via a portal from which data is transferred into the system (ERP, Cloud) of the customer. Interfaces (OPC UA, RestAPI, MQTT, XML, SMS, Twitter, ftp, Email)) to the customer are freely selectable. End-to end encryption and TÜV (German Technical Supervisory association) certification ensures maximum data security. IoT Edge Gateway DATAEAGLE 7050 speaks the language of all machines. All Ethernet-based fieldbus systems are available as an option. This enables measuring machine data in all over the world and setting new parameters. As an option, sensors can be connected via Bluetooth Low Energy or additional I/O modules can be connected. 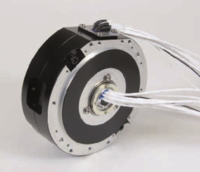 The contactless data transmission modules for rotating systems are used, among other things, wherever safe data transmission by means of slip rings is no longer ensured, due to large outer diameters of the system and higher data rates.